Endodontic Retreatment is a corrective procedure used when a root canal or endodontically treated tooth fails to heal properly or is painful. Pain may continue to exist after the initial root canal treatment. Sometimes, pain may return months or years after treatment. 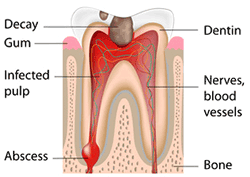 With the proper dental care, teeth that have had endodontic treatment should last as long as natural teeth. Time to complete - 1-3 visits to complete. Procedure - Dr. Clausen will remove the crown and post, and clean the root cavities. X-rays will show if the canals are thoroughly clean. Medication may be applied, and a second visit may be required to complete the cleaning and resealing process. The tooth canals and cavity are repacked and sealed then a crown is applied.